Jason Hughes, the brother of late Phil Hughes, sledged Warner while he was batting. Beleaguered Australian cricketer, David Warner’s wife Candice Warner has jumped to defend her husband over the sledging incident that took place during the round four of the ongoing NSW Premier game. Warner is playing for Randwick Petersham in the tournament and was in the middle when the opposition players had a go at him. David Warner stormed off the cricket pitch after an ugly on-field sledging which led to the batsman leaving the field has left the media and the fans fuming over it. 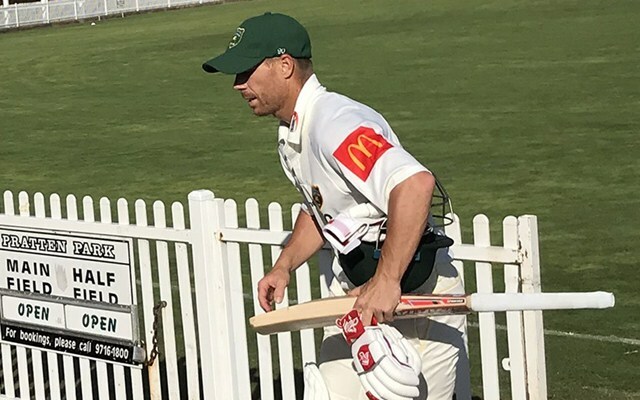 However, Warner returned to the crease after some time and was fortunate enough that the umpires and players from Wests allowed him to come back. According to the laws of the game, once a player walks off the field, he/she cannot return. While the cricketing fans have exemplified a forgiving nature towards deposed captain Steve Smith and Cameron Bancroft, Warner still remains under-fire for them. After the unfortunate incident, Warner has come under the scanner now and it seems that he still hasn’t gotten over what happened in South Africa a few months ago. While speaking to Channel Nine on Sunday, Candice Warner, the cricketer’s wife, denied to go into the details to the incident but she pointed out that something wrong was said to David Warner which disturbed him. She also went on to say that there is a difference between sledging and abusing and the words thrown at him hurt Warner which led to him walking off the field. “I’m not going to go into the details however David was taken aback by the comments and thought they went a little bit too far, so he decided to remove himself from the game. Everyone has their own opinion but I think there’s a difference between sledging and abuse. I’m not going to get into what was said, but yesterday went too far. I think he removed himself because he first of all didn’t like what he was wearing and where that could have been taken. It was very hurtful,” she said. Alarmingly, the main instigator of the sledging incident was Jason Hughes, the older brother of late Phil Hughes, who sadly passed away in the year 2014. Jason Hughes called Warner ‘disgrace and weak’ while the latter was batting. Phil Hughes and Warner were very much close friends and it is pretty much perplexing to see his brother sledge the left-hander. Get the latest Cricket News and updates from Pakistan vs Australia series, Match Predictions, Fantasy Cricket Tips and lots more on CricTracker.com.